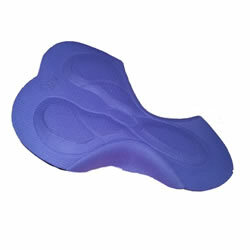 * Women's Spin Chamois Pad for comfort on the saddle that is engineered for high impact shock absorption. * Prevent chafe between the legs with the seamless design that wraps the inside of your body for smoothness and no bunching..
* This garment has an exterior side pocket to hold a small personal item like a key or music player. * Light-weight wicking luxury Chamois Pad that is designed to be super cool, lightweight and breathable. 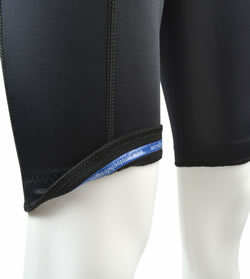 * Reflective piping for visibility in case you fall in love with these shorts for outdoor rides too! * Silicone Grippers keep legs in place. 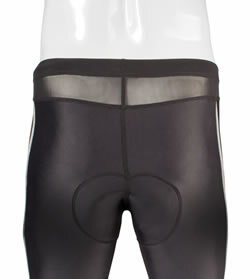 The chamois stays in place tight to crotch without bunching. * Nylon / Lycra tricot fabric has 6-way stretch to compress working muscles to enhance fresh blood flow and reduce buildup of lactic acids. * Inseam is about 8 1/5 inches unstretched. The Women's Spinning Chamois has a surface fabric that is brushed and soft. The pad has a luxurious stretchy feel with knitted micro mesh for breath-ability and air flow in the bike seat area. It is naturally antibacterial and stays dry. The Women's chamois pad is engineered with special skive cutting technology that enables multi-densities of Foam within the chamois padding, The pad lightweight, perforated and breathable for rapid sweat absorption, shock absorption and protection from chafing. 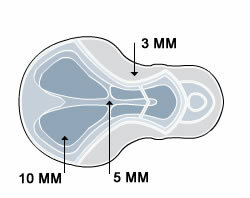 The fabric of the women's chamois padding has a wonderful hand, it is soft yet dense where you need it. The pad overall is a stretch fabric with knitted micro perforation for breath-ability and air flow in the saddle area is soft to prevent chafe. Note: Inseam is approximately 8 1/2 inches unstretched. I bought a pair they were ok but i found them to chafe on the inner crotch. My friend has trimbo workout shorts for women and swears by them so i'll probably give them a try. I have a pair of these and really like then. I bought my wife(a beginner) a pair and she really got rubbed raw 'down there' after her first spin in them. The padding got off-center while she spun. I have gotten some of the butter and she will try that. I think maybe a normal bike short with softer padding is next. I am new to cycling long distance, and to using a road bike. 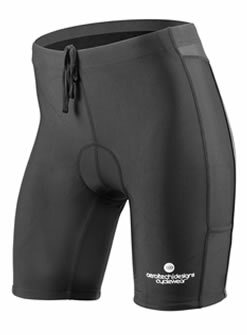 The seat on my road bike was killing me, so I decided to try out padded cycling shorts. These made a huge difference for me. I was worried that I might have to spend $100 or more before the padding would matter, but these solved my problem and are very affordable. I love these shorts! They do not ride up on my legs either, and I can comfortably run in these as well. 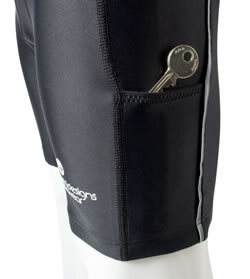 I'm training for a sprint triathlon and am planning on wearing these shorts for the race. I have tried running a couple of miles and then biking 12+ miles, and these shorts have eased the pain considerably. I highly recommend them. Anything coming from Pittsburgh is awesome and these are no exception! I've been TRYING to take a spin class for a couple of years. I'm a senior citizen and a friend took me to a class at our gym, it was a half hour ride and then a walk around the indoor track. I barely made it through the half hour ride and as everyone else walked the track, I left the gym. OUCH!!! Next I tried a class after buying a padded seat. OUCH!!! Then I got a seat padded even more and tried a GENTLE RIDE class (45 min.) better but still hurt. Then I got these shorts. I went to the Gentle Ride class this past Wed. I put the padded seat, but I don't really think I needed it! These shorts are the greatest thing since sliced bread. I was able to sit on the seat, it wasn't like the bike I had when I was a kid, but I could actually sit and pedal! Now I am really looking forward to taking this class again. Who knows maybe I'll be able to work up to taking a regular spin class some day. Thank you! I use these shorts during my spin class and it makes it more comfortable and causes less pain from the seat.